A bit of community sleuthing on the new Titanfall beta has revealed a little more of what the full game is likely to offer. Release something into the wild on the Internet, and its buried secrets won't stay buried (or secret) for very long. You can't have failed to notice that Titanfall's beta went live over the weekend, allowing those hungry for an all-new competitive multiplayer experience (i.e. one not called Call of Duty or Battlefield) to get a first taste of what Respawn Entertainment had to offer the industry. Reception so far has been very positive, but the beta is interesting for another reason: the files buried therein seemingly reveal something of what the full game will offer those who purchase it in March. As ever, it's the giant gaming community at NeoGAF that has been rooting through the files to see what it can find. Quite a bit, it seems, and assuming everything that has been found will be in the game on launch day -- not something we can necessarily rely on, this being an EA title -- it looks as if Titanfall will be fairly content-rich when it hits store shelves. First up, it looks as if the game will play host to at least fifteen different maps at launch. Besides the Angel City and Fracture maps beta players have already been enjoying, the other maps appear to be called Colony, Relic, Airbase, Boneyard, Corporate, Outpost 207, Lagoon, Rise, Smugglers' Cove, Overlook, Nexus, O2 and Training Ground. 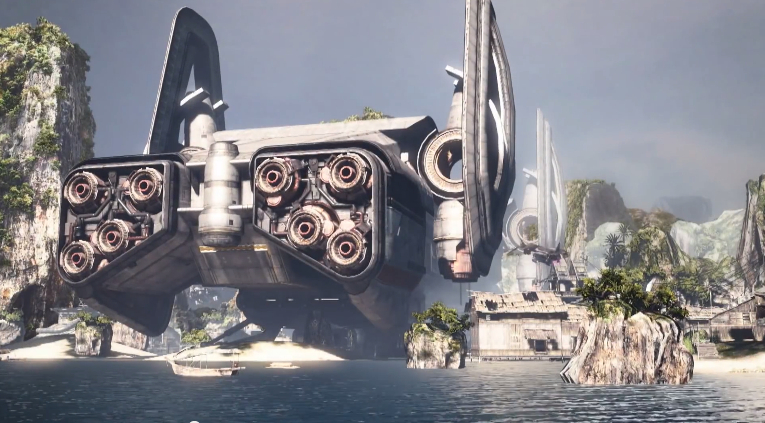 This is a shot from one of the newly discovered maps, most likely Lagoon, says NeoGAF. A bit of further tinkering revealed what appears to be the available game modes: there's the Attrition (AT), Last Titan Standing (LTS) and Hardpoint Capture (HP) modes currently listed, along with Team Deathmatch (TDM), Capture the Flag (CTF) and Variety Mode (VM), the latter of which provides a playlist that mixes all the previous modes together. Along with all this, there's the intriguing prospect of the Campaign Multiplayer mode -- rather than a conventional linear story mode, this instead throws you into combat against other players across all the game's maps and modes, with story elements unfolding as you play. It's an ambitious -- and as yet unproven -- idea that has the potential to change the way we think about how narratives are presented in games like Titanfall. Or it could just be a colossal mess; we'll have to wait until March to find out. Continued ferreting around among the game's bits and bytes revealed a bunch of Call of Duty and Battlefield-style perks for both pilots (on-foot players) and Titans, ranging from the ability to show the AI grunts and Spectres on the minimap to the Wall Runner enhanced parkour kit. Some of these are already usable in the beta; others will only show up in the full game. Other discoveries include weapon classes and specific ordnances for both pilots and Titans; you can check out all of the community's discoveries to date on this NeoGAF thread. Tagged with beta,	News,	Respawn Entertainment,	Titanfall.